This week, it snowed. And stayed cold all week (cold enough to kill my sprinkler system's backflow vacuum breaker valve because I did not think to drain it). Oh, well. I found some things to keep me occupied inside where it is warm. I still need to cut the tops from 1/4" transparent acrylic. I will *not* seal the holes - I need a place for air to get in / out. Eventually I will add little fans to each one to keep them even cooler. But this was enough for now. Next up - my daughter has a production of The Witch of Blackbird Pond at the local theater, so I'll be doing only sporadic work on the Volt914. Today was a busy day. The goal this weekend is to get the car moving again. Failing that, I at least want to get all the boxes and batteries in place. However, before I can do *that*, I need to do a few mods to the car. 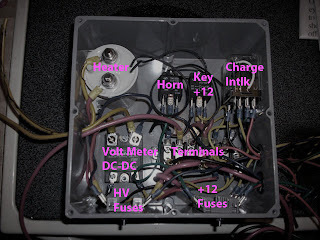 First, due to the larger size of the PFC-20 charger, and due to the need to have the Rudman Regulators on top of the front battery box, I need to move the charger to the rear trunk. Also, I've been frustrated with voltage drops in the 12V system - the ElectroAuto kit pushes everything from the front via a 10 gauge cable, which has proven inadequate. Finally, I want to make provision for some sort of heating system for the batteries - a water bed heater is likely for each box, but I have not finished thinking about this. Regardless, I'll need a 120V power line for the front and rear to handle this (I want the battery heaters on a separate circuit from the charger). The red cable is the 4 gauge power cable; the thick orange cable is the 10 gauge 240VAC cable (longer because it goes all the way to the rear trunk) and the thinner orange cable is the 16 gauge 120VAC cable. Not shown - I taped that up and then put red heat-shrink tubing over the entire assembly. You can see one of the regulator connectors fed through - I was testing to make sure it would fit (it does). Tomorrow - installing the middle and front racks and batteries. And redoing the front relay assembly. And then building and attaching battery interconnects. And (maybe) taking the car for a spin if I'm lucky. For my AGM batteries, I purchased Rudman Mk2 Regulators from Manzanita Micro. The regulators will sit outside the battery boxes in little boxes of their own, with fans to keep them cool and transparent tops so I can see the lights flashing. This means, though, that I need a disconnect system so I can service the batteries when needed. The disconnect will also serve as an easy way to charge individual batteries if needed. Next, you crimp the terminal over the wire and seal. There should be a little bit of wire showing on both sides of the wire crimp. GM recommends soldering at this point. But I'm lazy. I did some sketching, and the 11 inch length of the male ends should be plenty to get outside the battery box for all the batteries. I also plan on making a couple of battery charger female disconnects. But my hands are tired, it will wait for another day.